Distinguished engineer Professor Bashir Al-Hashimi CBE has spoken to the Royal Academy of Engineering (RAEng) about racial diversity in academia and industry in an interview marking Black History Month. 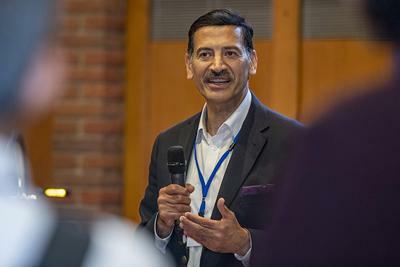 The Dean of Faculty, which includes the School of Engineering, is one of over a dozen prominent black, Asian and minority ethnic (BAME) engineers who are sharing their stories this month in an online diversity series. “I am pleased to see more and more high-tech companies embracing racial diversity through BAME post holders in key executive roles,” he says. “Whilst Black History Month provides a welcome opportunity to celebrate past achievements, it also enables us to consider next steps to embed a more inclusive, equal and racially-diverse culture at our institution. The University of Southampton signed the Equality Challenge Unit’s Race Equality Charter (REC) in 2016 and Bashir is leading the institution’s forthcoming submission for a Bronze Award. The University is committed to supporting equality and diversity for staff and students in higher education and is inviting widespread participation in the important discussion through an inaugural REC event on Thursday 18th October. A guide to Black History Month events taking place across Hampshire, marking the 70th anniversary of the Windrush generation, is available to download on the University website. Bashir is an Arm Professor of Computer Engineering with a worldwide reputation for research into energy efficient and reliable embedded systems. Earlier this year, he was awarded a CBE in the Queen’s Birthday Honours for his services to engineering and industry. You can read Bashir’s full interview with the RAEng through the Celebrating leading minority ethnic engineers online feature.